The Technodrome Forums - View Single Post - TMNT for MUGEN, what's all available? 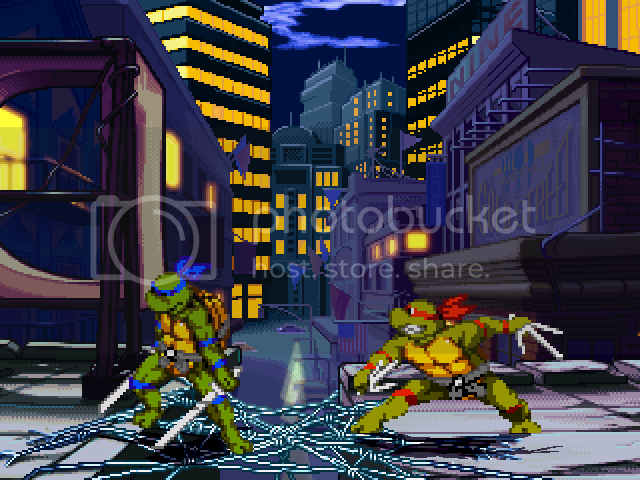 Thread: TMNT for MUGEN, what's all available? Finally reached a point of completion with these guys. Their special intros with one another won't be triggered in WinMugen (its some weird thing that the old engine can't pick up on.). Anyway, if you want to use them to their fullest you need to install them in MUGEN 1.0. Please let me know any bugs or issues you find, thanks. & Lastly you, for your amazing patience, enjoy. The Problem with the Intros not activating in WinMugen has been resolved by KojiroBADNESS! I feel like I'm a bit of a broken record here but I reccomend everyone redownload each character. They are now fully backwards compatible with WinMugen and their special intros will display thanks to KojiroBADNESS rewriting the triggers. Apparently WinMugen has an issue with not recognizing Enemies at the start of a round so he fixed the initial triggers I'd written to p2name and everything works flawlessly. Please update them yet again. Last edited by dcat; 01-24-2011 at 05:58 PM.